Tournaments, tournament play, rules, systems, etc. For 34 years, starting in 1981, Le Mondial de Millau was one of the most important petanque competitions (perhaps THE most important competition) in France and in the world, attracting the world’s top pétanque players. Unlike Le Mondial la Marseillaise à Pétanque which is only a triples event, Millau held open singles, doubles, and triples competitions for both men and women, as well as a mixed triples competition. It was a 5-day pétanque festival that attracted 15,000 spectators (or 50,000, depending on who you ask) and 5,000 players. It was supported by an army of 400-500 volunteers. While it was being played in mid-August, it was impossible to find an un-booked hotel room within 80 kilometers of Millau. The process begins with someone (the club president, for example) assuming the role of competition organizer. He (or she) takes a head count of the number of members wishing to play. On the basis of the count, he decides what kinds of teams are needed. Suppose, for example, that there are 14 players, and 3 pistes are available. Three pistes can accommodate three games — 6 teams — playing at the same time. Therefore, he needs to form 6 teams. So he might decide to organize four teams of two players and two teams of three players. The players line up. The organizer places a jack in front of the players at some random distance, say eight to ten meters. 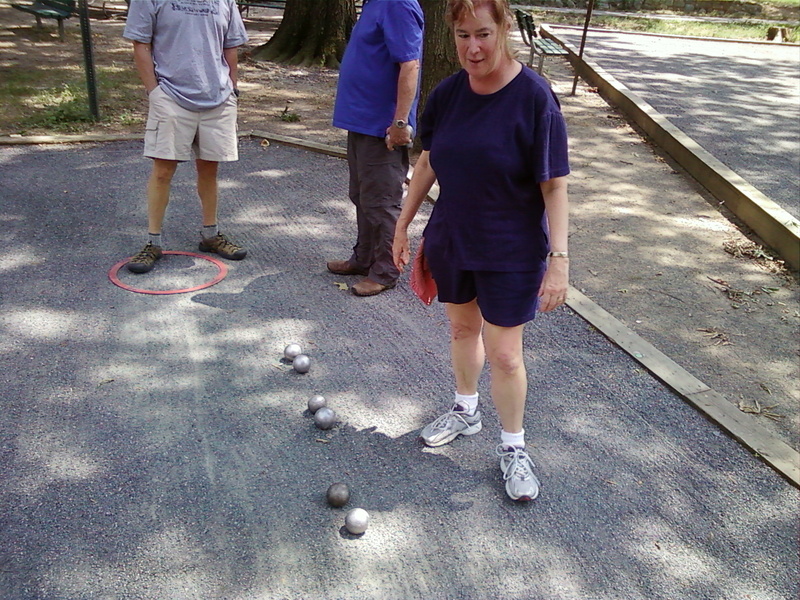 Then, on the organizer’s count of “one… two… THREE!” everyone throws (points) their boules at the jack. 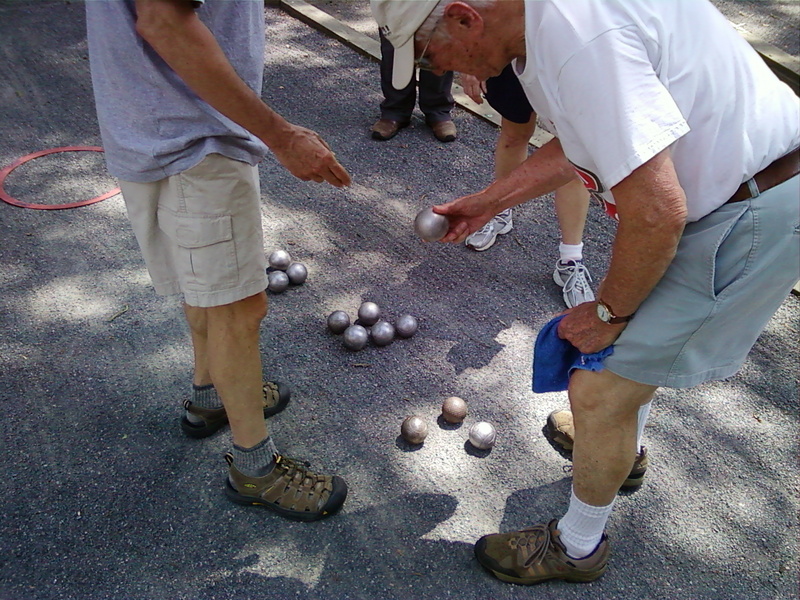 The competition organizer then goes through the boules and assigns them to teams — the closest boule to team 1, the second closest boule to team 2, and so on. The process works best when you have two people doing the organizing. 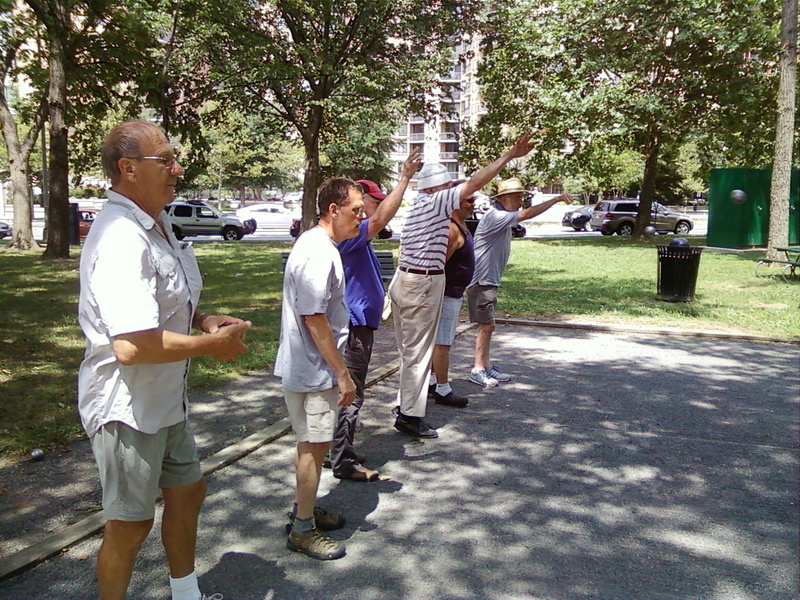 One person selects the boules in order of their distance from the jack. He/she picks them up in order, and hands or rolls them to the second person, who arranges them into teams in the order in which he gets them. In the photo below, Ronnie (the lady in the dark shirt) has laid out the boules of the six players from (her) right to left, to form the basis of six teams. 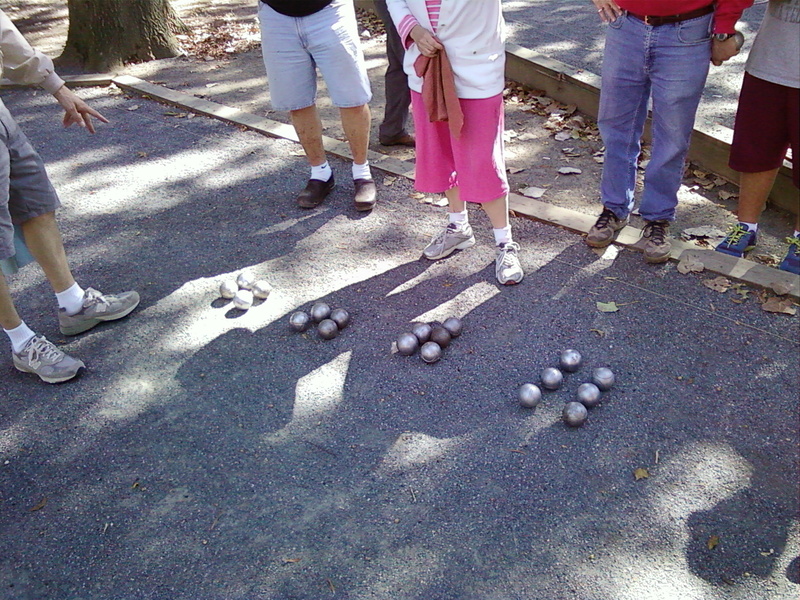 Note that the boules are grouped into pairs. The pairing indicates which teams will play each other in the first round of games. The rest of the boules in turn, from closest to farthest, are added to the teams. The photo below is from a different meeting of the club, which was attended by 19 people. The organizer has decided to set up eight teams — five 2-person teams and three 3-person teams. In the first round of games, team 5 (in which 2 players use 3 boules each) will play team 6 (in which 3 players use 2 boules each). If there are players that arrive later, they will be added (between games, or between ends) to one of the two-person teams. After the boules have been grouped into teams, each player picks up his own boule and finds out who his team-mate(s) will be. To start the event, team 1 plays team 2, team 3 plays team 4, team 5 plays team 6, and so on. After that, as the various games finish, winners play winners and losers play losers. 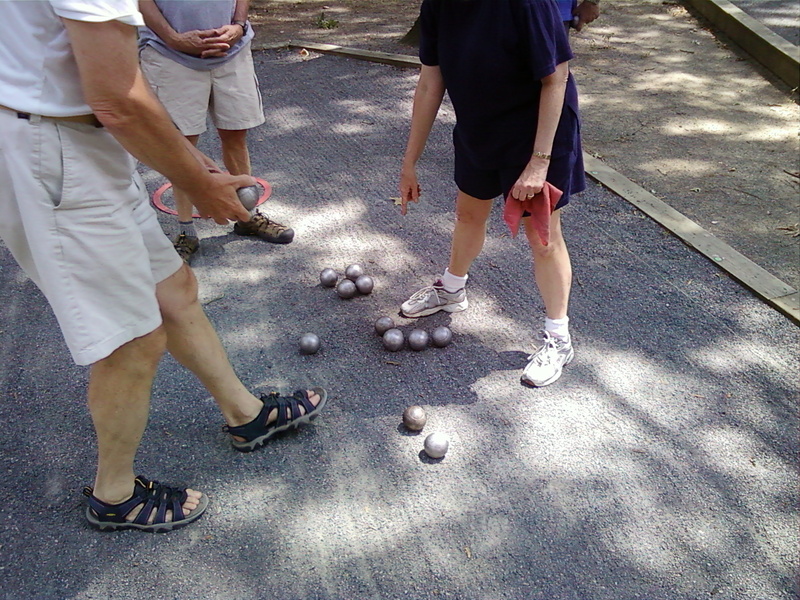 A possible variation of this technique (used by the Washington DC National Capitol Club de Petanque, where these pictures were taken in September 2013) is to conduct two separate throws. First there is a throw for the recognized shooters in the club. Then there is a second throw for everybody else. In a club with a wide variety of skill levels among the members, this helps to distribute the shooters more or less randomly among the teams. 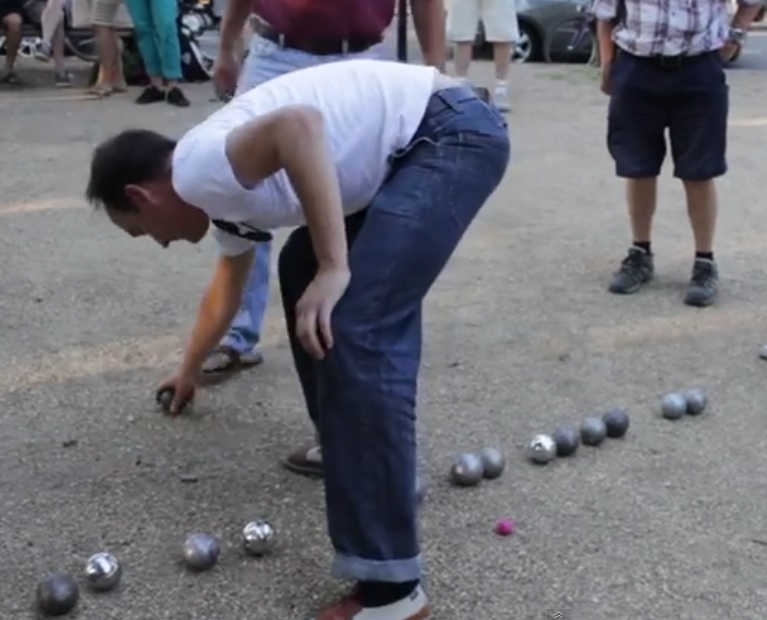 Here is the London Petanque Club choosing teams via a melee, July 2014. You can watch it on YouTube HERE. Please visit its new location on the Petanque Rules web site.